Sangster! Fisher! Cushing! But, no Lee. 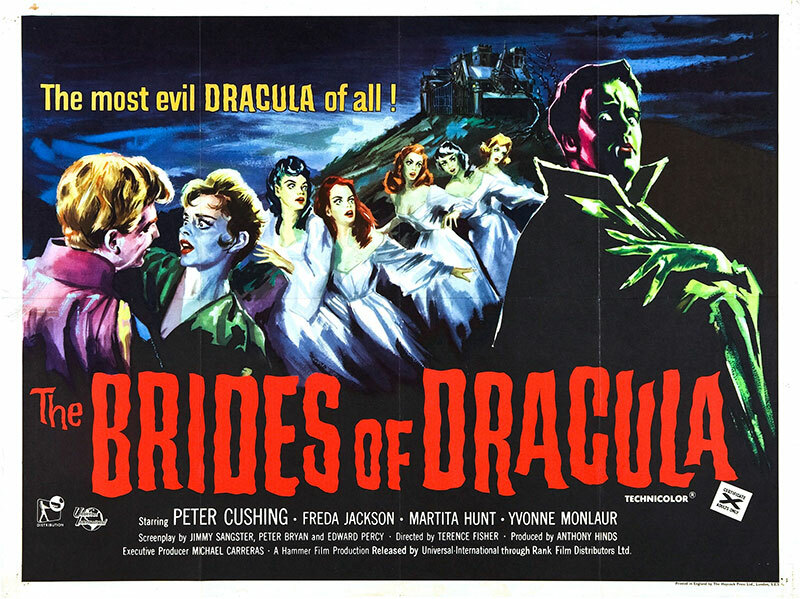 Despite the name ‘Dracula’ being in the title of this film, The Brides of Dracula, Hammer’s 1960 follow-up to its Dracula remake, does not feature either Dracula or Christopher Lee playing him. But that could be forgiven, right? The title could be referring to the actual brides who lived in Dracula’s castle in Transylvania, only that isn’t the case, either. Not only is this film not about Dracula, it’s not about his brides. Instead, it features a completely different vampire in a completely different Transylvanian castle. That is gross misdirection on the part of Hammer. Before I castigate Terence Fisher, the film’s director, too much, I have to mention Anthony Hinds. This is the sixth review of the October Hammershow yet only my first mention of Hinds, who was the son of Hammer’s founder, William Hinds. Anthony Hinds was as much responsible for Hammer’s horror transition as anyone, and produced many of the films reviewed this month. When a production company mails in something like The Brides of Dracula, I’m more inclined to blame the people who cut the checks rather than the folks behind the camera. Hammer made some real dogs. We’ll get to them this month. The Brides of Dracula is generally regarded as a good film. As of this writing, Rotten Tomatoes scores it at 73%, and IMDb has it at 6.8. Not great ratings, but better than I’m willing to give this film. It may sound like I’m ticked off at the deceptive title, and therefore unwilling to give the film fair criticism. Well, the title is a con, and viewers, especially those that paid expecting to see a Dracula film, have a right to be peeved. But, I am capable of compartmentalization, so let’s put aside the cash grab title and delve into the actual film. The Brides of Dracula follows Marianne (Yvonne Monlaur), a young woman on her way to take up a position at a finishing school for girls in Transylvania. But her carriage abandons her in a small village as night approaches. The people in the town are very skittish as night draws near, to the point that many are unwilling to help the very attractive, stranded Marianne. Truly a sign of fear, that. A damsel in distress is normally irresistible. Marianne finds a savior, of sorts, in the Baroness Meinster (Martita Hunt), the aged landholder of the village and all its surroundings. She offers Marianne shelter at the Meinster castle for the night. There, Marianne discovers that the Baroness has been keeping her son, the current Baron, prisoner in the castle. Marianne thinks she is doing the right thing when she frees him from his captivity, but, of course, it turns out that she has set free a vampire. The Baron Meinster (David Peel) is a bloodsucking creature of the night, and letting him loose brings terror to the village. Luckily for them, the local priest saw the danger on the horizon before the film even began and sent for Dr. Van Helsing, vampire killer. Van Helsing (Peter Cushing) arrives on scene just in time to do battle with the Baron and save Marianne. There’s a rip-roaring story in this flick, and, at 81 minutes, fantastic pace. But it’s just so cheap and manipulative. Hammer’s previous Dracula film was a paring down of the original source material due to budgetary constraints. This film feels like it just ticks off Vampire film boxes in order to satisfy audience expectations and get this one in the can as quickly as possible. Subtlety is largely absent from this film. Surprisingly for a Hammer film, the production is lacking, as well. The vampire makeup is very poor. The sets are meticulous, as always, but are overlit to the point I was distracted. It’s great that Fisher and company wanted us to see so much of their great sets, but they lose any of the built in mood that gothic settings provide. Don’t think that I believe this film is bad. It’s not. But I didn’t enjoy it all that much, either. Peel made for an unconvincing villain, and while Cushing was as reliable as ever, his efforts feel a bit wasted in a production that reminded me more of a live television play than a film. But, of course, the ultimate culprit in this film’s mediocrity is Christopher Lee, who refused to sign a contract to reprise his role, thus forcing numerous changes to the script. The cobbled-together nature of this film is evident throughout, as Lee left a huge void. I’m going against the grain on this one. I found The Brides of Dracula to be a disappointing second entry in the Hammer vampire flicks.